There's just one more day until Christmas is here, and the stars are getting into the holiday spirit on social media. The mother-daughter pair wore matching Parisian themed pajamas as baby Katherine gazed out the window. Mindy smiled from ear to ear as she held onto her one-year-old little one. 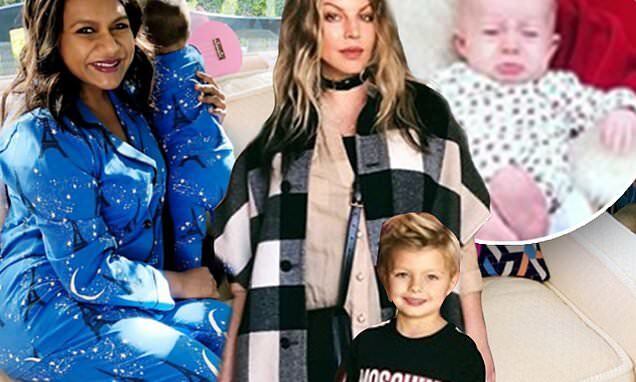 The Mindy Project star wasn't the only doting mom sharing sweet snaps of her children on social media ahead of the big holiday. Fergie posted a snap of her 'Christmas date', her five-year-old son Axl. The singer looked chic in a plaid coat, button down beige blouse, black skinny jeans, and beige ankle boots. Hilary Duff's traditional took the traditional holiday photo with Santa Claus, though her newborn daughter Banks didn't look all that happy.